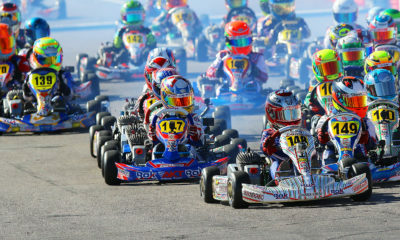 CRFKC ROK Cup Champions Determined Under the Lights at Goodwood – CKN | CanadianKartingNews.com | Because Karting is a way of Life! 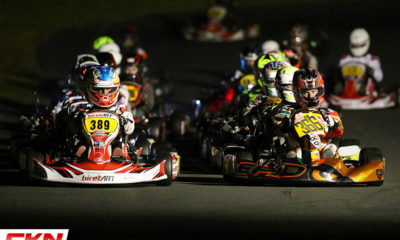 The fourth season of the Champion Ron Fellows Karting Championship was wrapped up at Goodwood Kartways on Saturday at the annual night race, the only time on the season that racers get to tackle the track under the bright lights. A cold front that rolled in Friday evening dropped temperatures and provided the first race in many months that wasn’t smothered in heat and humidity. 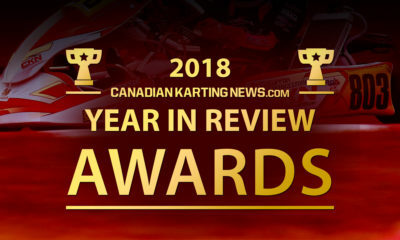 With Fall looming around the corner, the change was just another hurdle for drivers and teams to tackle as they pursued the race victories and championship titles. The day at Goodwood was split into two parts as a TRAK club race was held in the morning to make up for an earlier race this year that was postponed. The double-header opportunity gave drivers plenty of track time, where action on the track ran for almost 12 straight hours. We must commend the officials and track workers for persevering through the conditions to ensure the day and night activities went off without a hitch. 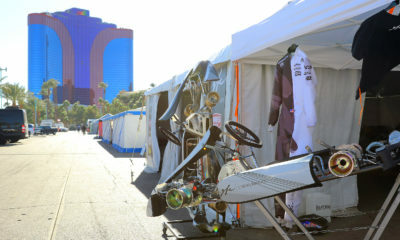 For the Rok Cup Canada categories at the CRFKC, the class champions would be awarded tickets to ROK the Rio in Las Vegas, putting a little extra into the final regional race on the Ontario calendar. 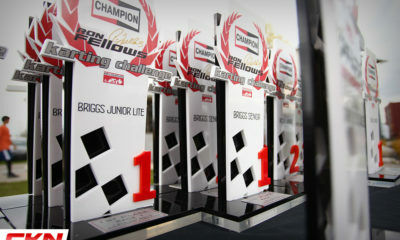 Click here for the CRFKC Briggs & Stratton classes report! 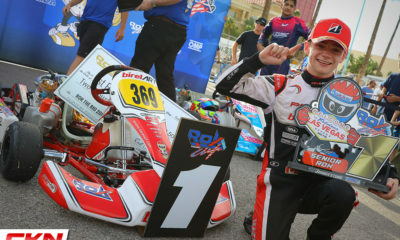 Driving home his third CRFKC race win of the season, Ryan MacDermid (Prime/BirelART) led the way in ROK Senior and brought home the title a year after finishing runner-up in the championship. MacDermid swept the evening’s activities, overtaking Robert Soroka (REM/Kosmic) at halfway and then holding him off in the final laps to score the win. With Soroka finishing second, he confirmed the vice-championship and was awarded the ROK the Rio ticket with MacDermid already having one to his name. Both will represent Canada in Las Vegas. Third place went to Nicholas Hornbostel (REM/Kosmic) as the top-three replicated their finishing order from round four at Mosport. 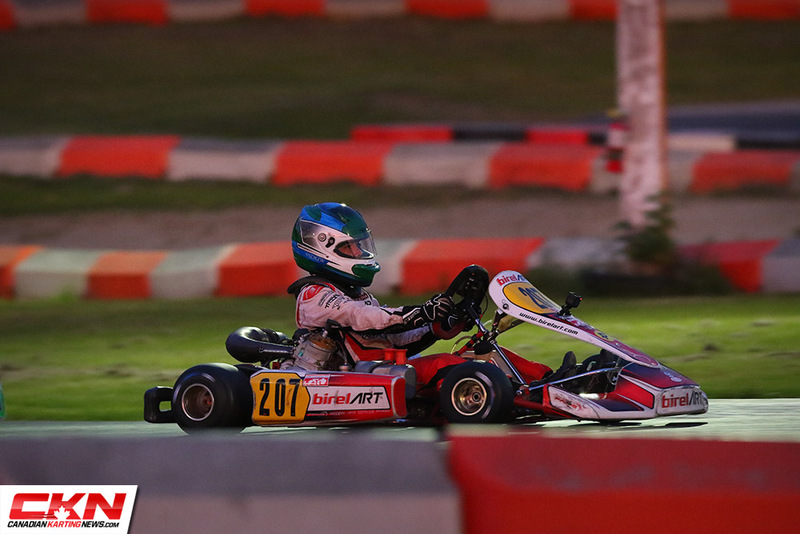 With the championship already secured courtesy of four wins in four races, Dale Curran (REM/Kosmic) took the opportunity to sit out the final round and heal a nagging rib injury in preparation for the Rok Cup International Final in Italy. In the Final, it was a close affair on track with Andrew Maciel (Prime/BirelART) being chased by Nolan Bower (VSR/TonyKart), while the rest battled hard for third. 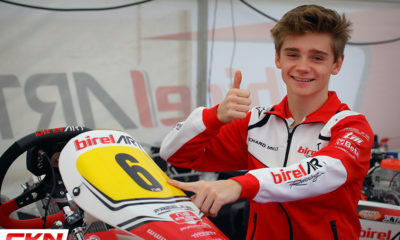 Maciel fought off any look for the lead Bower made and took his first win of the season while Gianluca Savaglio (D’Arrigos/Exprit) moved up from seventh on the grid to grab the final step of the podium. With Curran as Champion, Bower finished runner-up. 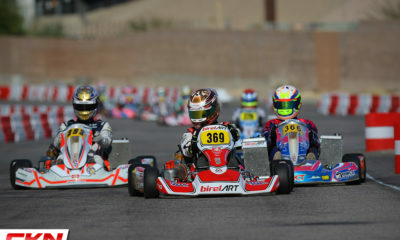 Marcello Paniccia (Prime/BirelART) finished third overall, just barely staying ahead of Maciel and Savaglio as the three were separated by twenty points in the final ranking. While Frankie Esposito (Prime/BirelART) jumped out to an early lead at the beginning of the year in Mini Rok, Ayden Ingratta (AI/Kart Republic) closed the gap throughout the summer at Mosport Kartways and going into the championship finale, the two were very close in points. 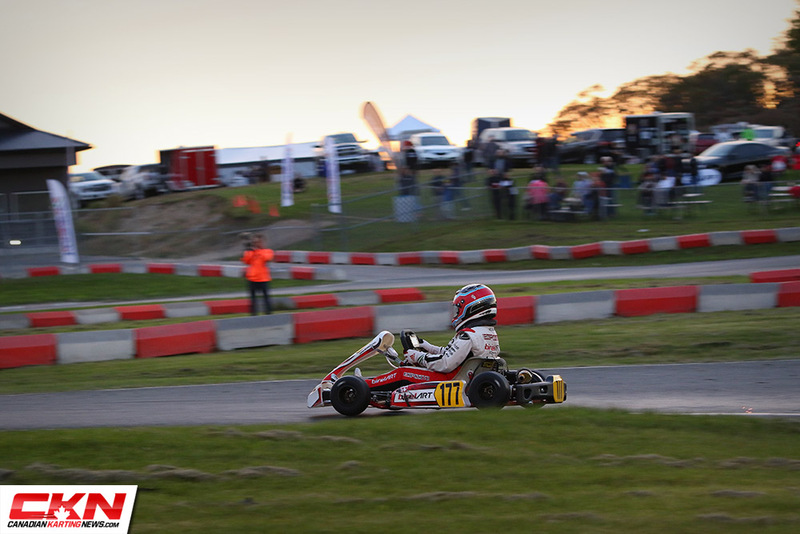 With the sun setting on the Goodwood circuit, the two continued their season-long feud while Cole Newton (Prime/BirelART) joined back in on the action after missing the previous two rounds. The final laps of Saturday’s Final featured the best battle yet and it all came down to the run to the finish line. 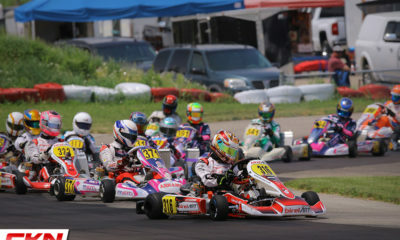 Trading the lead no less than three times on the final circuit, Esposito got the upper hand heading up the hill to turn seven. Successfully defending down the hill into turn nine, the final push to the finish line would determine the winner. Esposito left the door open just enough for Ingratta to pull alongside, but he didn’t have a enough run to overtake before the finish line as Esposito scored the win and championship by 0.072 seconds! 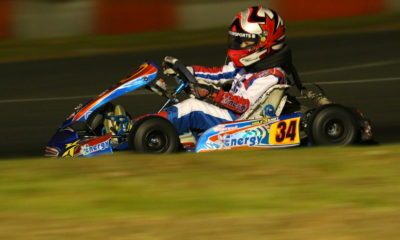 Newton took third, posting the fastest lap of the race in the process. Throughout the season Dan Bender (Intrepid) has crept closer and closer to victory, chasing down championship Joe Crupi (Goodwood/Intrepid) on many occasions. 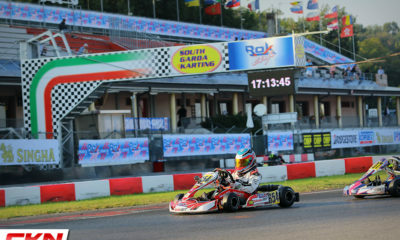 On Saturday evening, Bender spent the opening laps battling with Crupi until the two came upon a Rok Senior accident. Making the right moves, Bender avoided the clash and overtook the Master’s leader in the process. 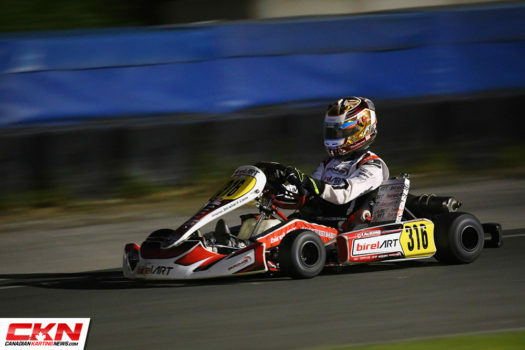 Putting his head from there, Bender drove to his first victory of the season and with it, brought home the honour of being the Pfaff Motorsports Senior Driver of the Day. Crupi would retire with just over a lap to go, moving John Cariati (Intrepid) up to second and Alexander Mankovski (Intrepid) onto the podium. 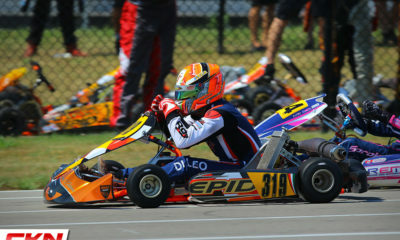 With his dominant season, Crupi remained on top in the standings and took home the championship. 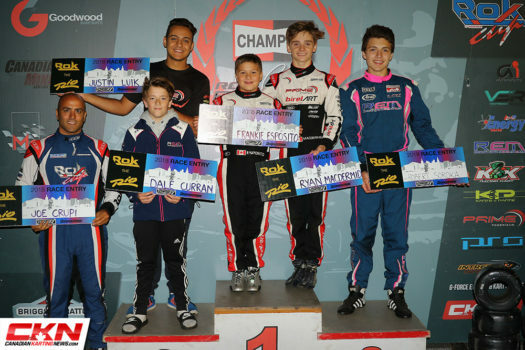 As the only Rok Shifter driver to sign up for the final round of the championship, Justin Luik (Prime/BirelART) confirmed the championship for himself while his rivals sat at home. 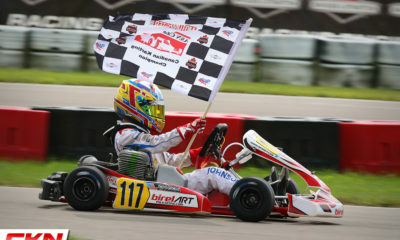 Dean Cotton (BirelART) was also the only driver in Shifter Masters.